We’re excited to have the Miru 1-Day contact lens available at Portland Eye Care. This lens comes from the Japanese contact lens maker, Menicon, that is best known for highly breathable materials for hard contact lenses. They have now invested their technology in making soft contact lenses as well, and the Miru 1-Day contact lenses are the most exciting product to come to the United States from these efforts. One of the revolutionary things about Miru 1-Day Contact Lenses is the packaging. 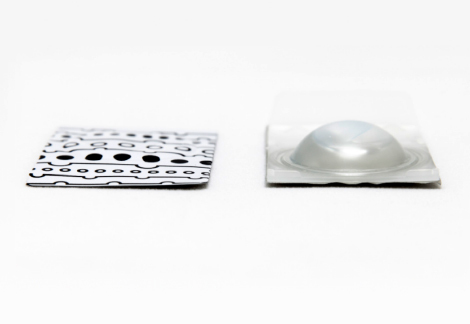 In the photo above, there is a Miru 1-Day flat pack on the left and a conventional contact lens blister pack on the right. Not only does this flat pack mean less environmental waste, and makes it more convenient to store in a wallet or purse, but this packaging is also easier to open. The patented design of the Miru 1-Day flat pack also allows for the Miru 1-Day Contact Lenses to come out of the package the right-way-up each time you open them. This saves patients from the hassle and discomfort of putting their contacts in backwards. If your last exam was with another office, we can request your prescription for Miru 1-Day Contact Lenses from that office, though it is sometimes faster for you to send us your prescription by e-mail or fax, or bring it by our office. Contact lens prescriptions are valid for one year. If it has been more than a year since your last contact lens exam, you will need a new eye exam and CL fitting or evaluation to ensure that Miru 1-Day Contact Lenses are still the best choice for your ocular health and vision. You canschedule your contact lens exam online or call our office with any questions.